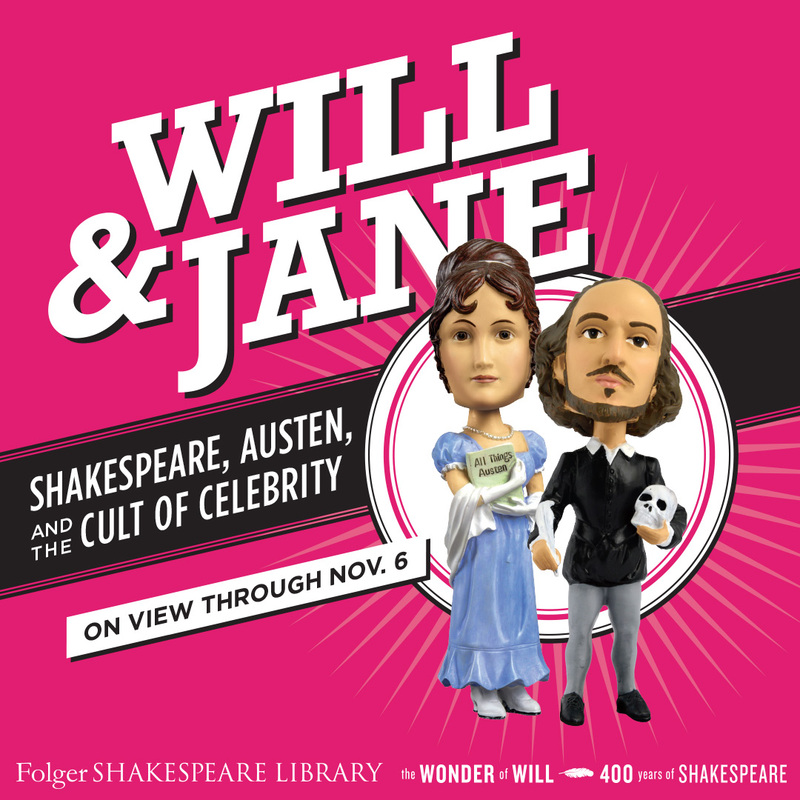 The exhibition Will & Jane: Shakespeare, Austen, and the Cult of Celebrity comes to a close on Sunday. Here are five highlights you won’t want to miss before they leave! Both Shakespeare and Austen have had their images used as advertising to sell everything from soap to gin. Will & Jane showcases some of these examples of celebrity marketing, including a can of Falstaff beer from the 1950s. Did you know? While Falstaff beer isn’t very well-known today, it was a major competitor of Anheuser Busch in the mid-twentieth century, and was both the first brewery to be granted a permit after Prohibition and the first one to operate plants in two different states. It’s also a bit of celebrity in its own right. In the opening scene of Steven Spielberg’s summer classic Jaws, a summer party is sitting around a bonfire when one of the party goers catches the eye of the ill-fated Chrissie over a plastic cup of Falstaff beer. Both Austen and Shakespeare’s works have inspired subsequent literary tributes, including adaptations (Bridget Jones’ Diary), sequels (The Virgin Queen: A drama in five acts attempted as a sequel to Shakespeare’s The Tempest), and parody (Pride and Prejudice and Zombies), examples of which are on display. 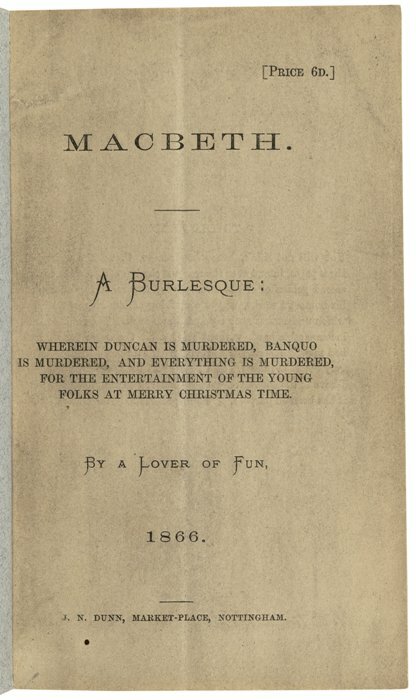 Ever think Macbeth would make an excellent Burlesque show? “A Lover of fun” did, and his (or her) published copy of the script meant for “entertainment of the young people at merry Christmas time” can also be found in the exhibition hall. Did you know? Helen Fielding’s book, Bridget Jones’ Diary, includes a scene in which Bridget conducts a disastrous interview with Colin Firth in which she cannot stop asking awkward questions about the Pride and Prejudice lake scene. Because Firth himself was cast in the movie, the scene did not make it into the theatrical release, but was nonetheless filmed and included as a DVD extra. 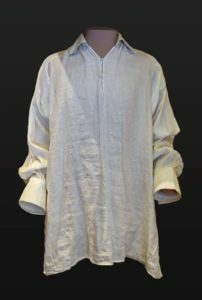 In addition to items that bear Shakespeare and Austen’s image, there is also a fascination with items associated with the authors during their lifetimes. We have no objects that can be directly traced back to Shakespeare, but items like the collection of wood fragments found near his birthplace in Stratford-upon-Avon still interest the public because of their proximity to the playwright. Austen, on the other hand, left behind a number of possessions, including a gold and turquoise ring. Replicas of this ring, like the one on display, are listed as best-sellers by the Jane Austen Centre in Bath. Did you know? In 2006, singer Kelly Clarkson purchased the actual ring at auction for £152,450, but was prevented from taking it out of the UK by the export ban. This ban is applied to items deemed by the British government to be national treasures, and had previously halted the export of a diamond-and-sapphire coronet given to Queen Victoria by Prince Albert, a watercolor painting by James Turner, and the “Birkin” Bentley Blower, the most expensive car sold at public auction. 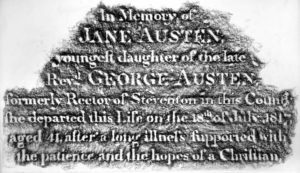 Grave rubbings have long been a way for people to pay homage to their favorite literary figures. 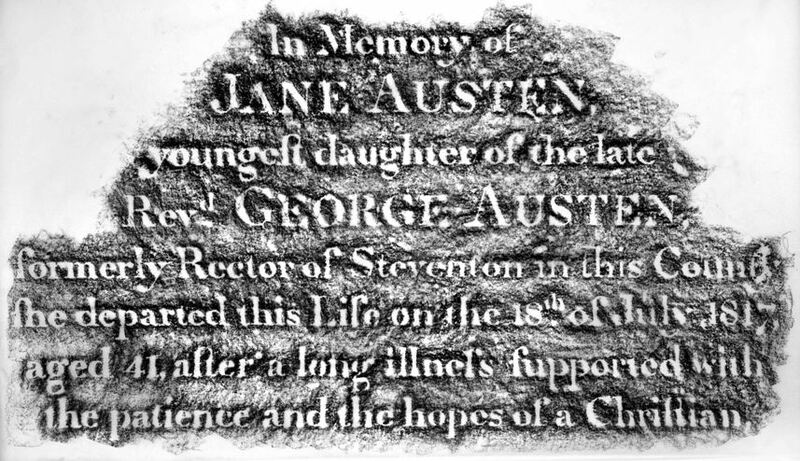 The exhibition features rubbings from both Shakespeare’s grave, taken in 1886, and Austen’s, taken with official permission in 2014. You can find them on the wall near the Shakespeare Gallery. Unfortunately for Shakespeare, it doesn’t seem his graveside warning worked. In 2016, researchers studied his grave as part of the 400th anniversary of his death only to find that his skull was missing, the possible keepsake of a particularly macabre fan. Alas, poor William. 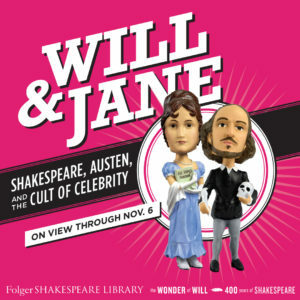 Will & Jane: Shakespeare, Austen, and the Cult of Celebrity is on view until November 6, 2016. Free admission. Click here for visiting hours and information. I don’t believe Shakespeare’s body has ever been exhumed. Researchers using ground-penetrating radar discovered his skull was missing. I saw a BBC documentary on the topic and the Vicar at Stratford was pretty clear they would never grant permission to exhume his body. Robin, you are absolutely right! Thanks for pointing out the error; it’s been corrected above.